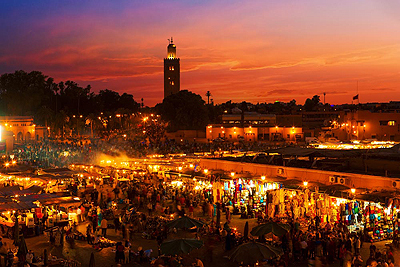 Fill the enquiry form to make a great Morocco Arabian Nights Itinerary & we'll help you to make your plan better. A journey to Morocco is a treat to all five senses. From some of North Africa’s most spectacular decor with the desert at its doorstep and the rugged heights of the Atlas Mountains to its bustling bazaars and world famous architecture one can’t go wrong with an adventure to Morocco. This trip is planned for the discerning traveller who is seeking to unravel the real Morocco experiences. You will explore colorful-painted towns that cling to hillsides, visit the imperial city of Fes, tick off the Sahara Desert from your bucket list where you will live in a Bedouin camp, take in the rose valley and end finally at Marrakech, the Jewel in the Moroccan crown. You will stay at locally owned Riad’s and get off the beaten path. This trip is particularly a delight for shutterbugs as it offers unparalleled photo opportunities giving you the chance to return with amazing memories. What’s there to think now? You start the tour as soon as you arrive at Casablanca airport (Please check on the flights you should be arriving on). Those wishing to spend extra time in the city of Casablanca may arrive a day earlier. Please contact us for the extra night details. Today you head out to the charming city of Chefchaouen. Explore this picturesque town with an expert guide, the town which is perched high in the Morocco’s northern hills. This is among the most illustrative examples of the country’s geographical and architectural diversity providing excellent opportunities for photography. Overnight stay at Chefchaouen. After breakfast at the hotel, you are free to explore the Blue city – Chefchaouen. Chefchaouen is a popular tourist destination and one distinction possessed by Chefchaouen is its blue-rinsed houses and buildings. Chefchaouen is a popular shopping destination as well, as it offers many native handicrafts that are not available elsewhere in Morocco, such as wool garments and woven blankets. After the local experience, you will head out to the imperial city of Fes. Overnight stay at Fes. After breakfast, you will head out to explore the ancient medina of Fes today by taking a city tour of Fes’s most precious monuments. You will visit the old Jewish neighbourhood (mellah), Al-Qarawiyyin mosque which is one of the largest mosques in Africa and one of the world’s oldest universities, ancient Quranic school and finally visit to the leather tanneries. Leather tanneries in Morocco still follow the ancient system of treating leather. It is rather fascinating to stand upon the rooftops and watch the tanners using nothing but their bare hands and feet to dye the leather. Overnight stay at Fes. Early morning after breakfast at your hotel, head out to the much awaited Sahara desert! Drive via Ifrane and Azrou to the apple city of Midelt, then onto the Ziz valley and finally Erfoud presenting spectacular sights and convenient pit-stop for photography lovers. 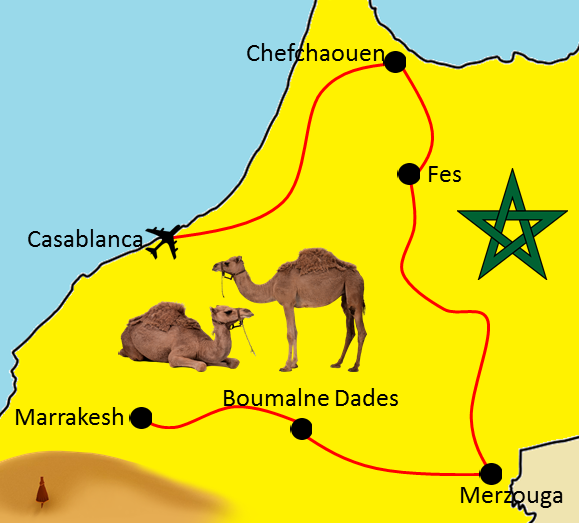 You will arrive in Merzouga near the Erg Chebbi dunes in the late afternoon. Relax, enjoy the local experience and take a camel ride into the dessert. Experience an overnight stay in the desert camp (during the winter season we stay at a hotel on the edge of the Sahara and not in the desert).